This no-waste recipe uses up the scraps of prosciutto that fall to the cutting board during slicing. 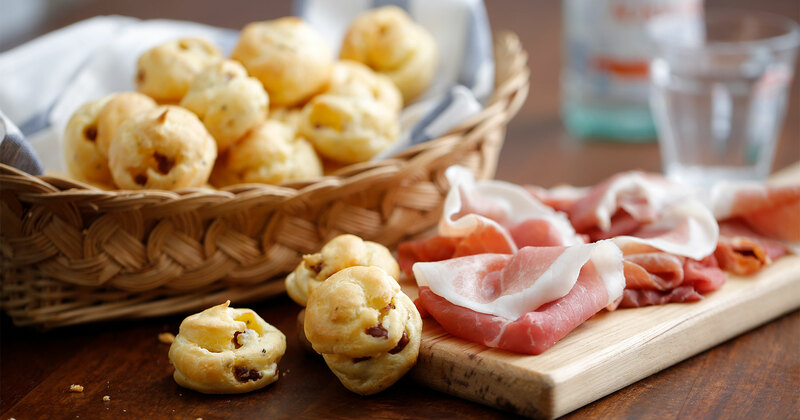 Served warm in a basket, the puffs make a savory appetizer for the table to share. Or menu them as a grab-and-go snack or accompaniment to a bowl of soup or pasta. 1. Preheat oven to 425°F. In medium saucepan over medium heat, combine water and butter. Cook until butter is melted and mixture is simmering. 2. Add flour; stir until flour absorbs the liquid and forms a dough. Continue cooking, stirring constantly for 1 to 2 minutes. 3. Transfer dough to stand mixer with paddle attachment. Let cool slightly. Add eggs, one at a time, and salt, beating until eggs are blended and dough changes from shiny to slippery. Stir in prosciutto, cheese and rosemary. 4. Transfer dough to a piping bag; pipe small puffs onto baking sheet, 2 inches apart. Bake 10 minutes. Reduce oven temperature to 350 F and bake an additional 15 minutes or until puffed and golden.